Certain indoor spaces often have issues with higher humidity, such as basements and crawl spaces. This humidity can condense and collect in your carpets and other surfaces, which will cause mold growth over time. The biggest issue with this type of damage is that it occurs slowly over time and is hard to notice until the damage has been done. If you know that your basement has a higher humidity, or you notice moisture on the windows or walls, run a dehumidifier in the space to keep it balanced. Many of the large appliances in your home have running water, such as your washer, hot water heater, and refrigerator. If these appliances leak, they can release a large amount of water in a short amount of time and cause lots of issues. Make sure that you are caught up on maintenance on your appliances, and check the areas around and behind them regularly for signs of leaks. Pipes are another large source of water damage in your home. What starts out as a small leak can quickly become a lot of mold in your home. Check the areas where your pipes might be tucked away, such as under the sink, for signs of water leaking. If you notice a small leak, take care of it right away instead of letting the problem build up. Yet another thing that can leak in your home is your roof. If you notice water dripping into your home during a rainstorm, you have an issue with a leaky roof. Consult a professional to fix the issue. Be sure to take care of the problem quickly, especially if you’re expecting bad weather in your area. 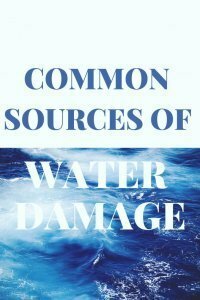 Sometimes, water is left running in or near a home, causing water damage. Be sure to double check that you turn off your sinks, shower, sprinklers, and garden hoses after using them. Supervise young children in the tub, and don’t allow them to draw their own bathwater. Adults aren’t likely to leave water running, but children are. Sometimes natural events, such as a big storm, cause flooding in homes. While you can’t prevent weather events, you can help protect your home. If you live in an area prone to floods, you should take the proper precautions and have a detailed flood plan. However, if you live in an area that doesn’t often flood and is expecting a big storm that could cause temporary flooding, setting up sandbags around windows and other entrances can help reduce or prevent water damage to your home. Unfortunteately, not all water damage can be prevetned, even with your best efforts. If you encounter water damage in your home, San Juan County Chem-Dry has water damage repair experts who are happy to assist you in removing the water, repairing the damage, and restoring your home to a clean and healthy state.